Here at the orthodontic office of Lisa P. Howard DDS MS, our team believes in the simple power of gratitude. What better time of the year to express our gratitude than Thanksgiving. 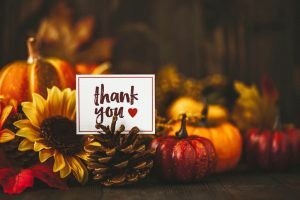 From everyone here at the orthodontic office of Lisa P. Howard DDS MS, we are extremely grateful to be given the opportunity to offer all of our patients and their families the highest level of orthodontic care we can provide and will never take for granted the trust you have placed in our hands.